Time to get your drawers organized! With many applications and configurations, these individual organizers can fit side by side to divide and keep cosmetics organized in your vanity and bathroom drawers! Each of the containers can stack on top of each other allowing for easy access to items below. Great for deep drawers! Purchase additional sizes to customize your organizational needs. Create modular sets to fit a multitude of items. Clear break-resistant plastic fits in any decor. Accessories shown are not included. No assembly required. Cleans easily with mild soap and warm water. Made in USA. 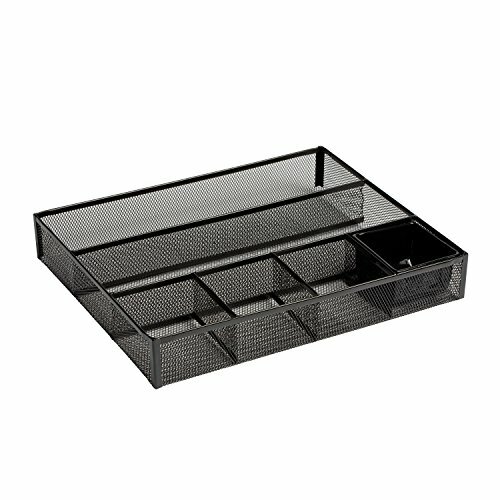 Rolodex Mesh Collection Drawer Organizer, Black (22131). Stylish desk drawer organizer enhances your desk's appearance. Mesh collection desk accessories have a simple and elegant industrial look and sturdy metal construction. Extra-long pen and pencil compartment means no more jumbled writing supplies. 3 small bins and 1 long bin accommodate odd-sized office supplies. Deep bins provide extra space for small office supplies. 11.75 inches long by 15.25 inches wide by 2.375 inches high. Experience color like never before--differentiate yourself with the deep, rich write of BLX black-infused ink. Ideal for the business traveler--contains a vented refill so pen won't leak or explode due to a change in cabin pressure during flights. Quick-drying, acid-free, archival-quality ink is fade- and water-resistant to last over time. Exclusive uni-flow ink system ensures a steady flow of waterproof, fade-resistant ink of consistent smoothness and color intensity down to the last drop. Micro point for fine writing. Uni-Ball Vision Ballpoint Pen blx, Micro Point. Stylish way to display business cards on your desktop. 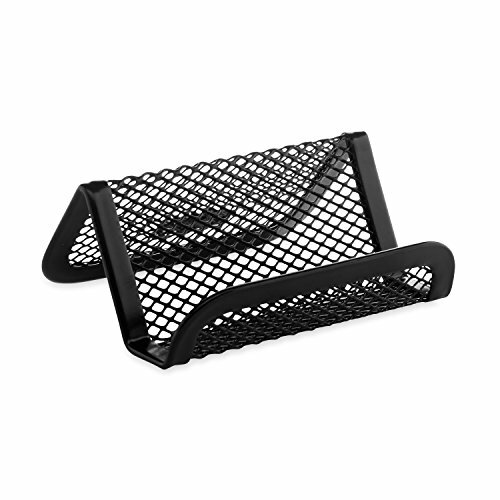 Mesh collection desk accessories have a simple and elegant industrial look and sturdy metal construction. Made of durable rolled mesh steel, the unique crisscrossed design gives your work space a curb appeal all its own. Open design allows for use with business cards of almost any size. 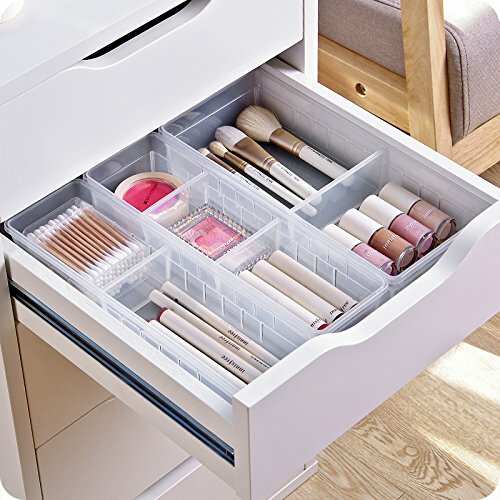 Create an organized space with Whitmor's 3 Section Clear Drawer Organizer. This clear features a sturdy clear resin construction. It is great for organizing drawers in the bedroom, kitchen, bathroom or garage.. Whitmor is a 4th generation family-owned and operated business. Since 1946, Whitmor has been dedicated to bringing organization home by creating products that simplify everyday life. Ensuring that those products are built with integrity, value, and innovation is our commitment to you. And our promise is that we will always be here for you should you ever need us as we stand behind our product 100%. Whitmor customer service is available in English and Spanish Monday through Friday from 8am - 4:30pm CST. Call us and we will gladly assist you in your language. Whitmor customer service Department, 1-888-944-8667 or customer_service@whitmor.com. EXACTLY WHAT YOU NEEDED: Mix and match the narrow draw organizer dividers tray for customized modular storage. 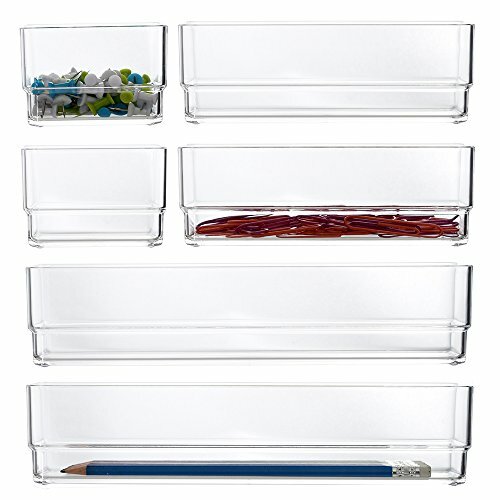 Made from durable plastic, these shallow drawer dividers organizers can be used together or separately, and rearranged to suit the exact dimensions of your drawer. The vanity drawer organizer helps you maximize unused spaces throughout the home areas including; closets, laundry, office and other living spaces. THE EVERYTHING INTERLOCKING DRAWER ORGANIZER - Say goodbye to cluttery and wasted space with this junk drawer organizer - a lasting storage solution. No matter where you use this set of 8 durable desk drawer organizers and storage - in the kitchen, bathroom, vanity makeup, or office - this multipurpose desk drawer organizer tray shallow keeps your things in order. You can freely mix and match them to increase the storage capacity in your drawers to fit a variety of home and office needs. HANDY & VERSATILE: Not just for the kitchen - organize office, bathroom, vanity and make up drawers too. Our small organizer bins are designed for the bathroom, kitchen, make up closet, laundry, cosmetic and more. The drawer separators are made to hold various sized items, designed to help people organize their homes and lifes! Because when everything is in its place, your morning routines run smoothly and your day starts off better. INTERLOCKING TEHNOLOGY help you transform your drawer into an organized space. This drawer organizer bins are shallow enough to fit your drawers. Filling the base of the drawer, these desk organizers and accessories for women help to organize your cosmetics and accessories. The desk draw organizer tray features multiple compartments, making it perfect for makeup! An uncluttered space is an uncluttered mind. With all the thinking, planning, dreaming, envisioning, drafting, creating, and strategizing you're doing each day, give your mind the gift of space. 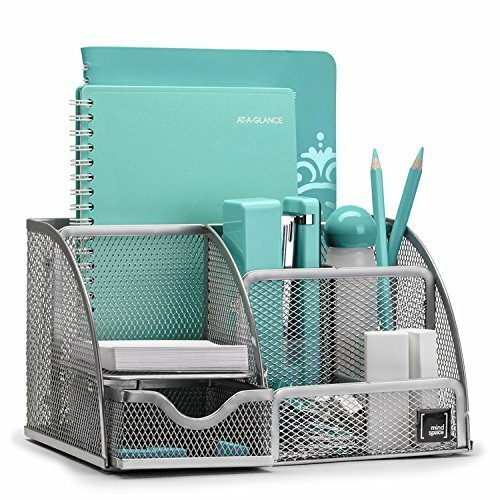 The six-compartment mesh metal desk organizer from our mesh collection is designed to store your office consumables in an airy yet sturdy compact desk organizer that feels at home in your office space - or any space. Finally - pens, pencils, sharpies, sharpeners, staplers, scissors, rulers, razors, glue sticks and binder clips, sticky notes and sticker dots, tacks and pins and postage stamps, and all the other odds and ends that find their way onto surfaces large and small - will have a singular space to call their own. Got stuff? Get rid of the clutter and expand your mindspace. ENOUGH SPACE FOR EVERYTHING. 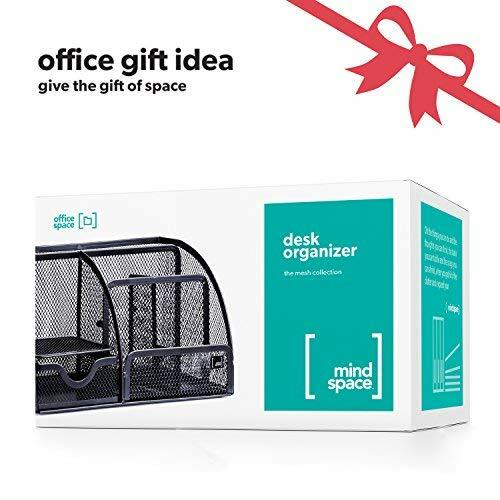 Desktop organizer with 6 compartments of well-thought out dimensions that will keep the stuff you need at hand, while staying out of your way. EASY ACCESS THAT MOVES WITH YOU. The desk caddy pull out drawer slides out smoothly and goes right back easily for expandable storage that's right there when you need it for all your supplies and accessories. EASY ACCESS THAT MOVES WITH YOU. Our desk organizer's pull out drawer slides out smoothly and goes right back easily for expandable storage that's right there when you need it. THE LIGHTWEIGHT HEAVYWEIGHT. Made of sturdy, mesh metal and a solid metal base, this one'll take all the pens and rulers you can throw at it, while being none the worse for wear. TWO DIFFERENT SIZES: Package includes 4 clear drawers(2 x Large + 2 x Small). The Storage Drawers Size : Large(L x W x H) - about 10.24'' x 4.65'' x 1.9'' and Small (L x W x H) - about 10.24'' x 3'' x 1.9'', Suitable for different drawers width. MATERIALS: Our Drawer Storage Organizers are made of sturdy plastic materials, which is eco-friendly and durable. EASY TO ADD & MOVE DIVIDERS: Each tray has 2 dividers, which can be taken out and moved around freely. Just adjust the drawer accroding to your need! MULTIPURPOSE: You can put some small stuffs in it. Such as snacks, cosmetics, stationeries, knives and forks or other tablewares etc. CLUTTER FREE: Best way to organize your kitchen drawers, office drawers, and dresser tops. Offer you a tudy and neat office/home environment. Organize desktop clutter with the Sorbus Bamboo 3-Tier Organizer! This all-bamboo design offers style and convenience for a tidy workstation. 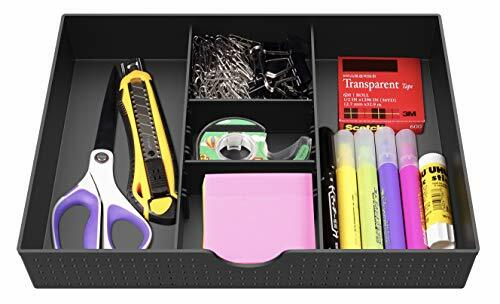 It features a top shelf for notepads, staplers, and other stationery while three deep drawers cleverly conceal paper clips, staples, thumbtacks, business cards, and other small items. 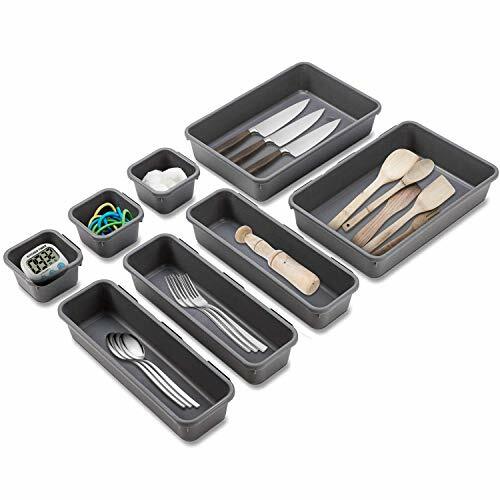 As a multipurpose organizer, it can be used for bathroom toiletries, cosmetics, jewelry, crafts, tech gadgets, and more. With multiple storage compartments, this compact piece makes a practical addition to any home or office. Effortlessly transform your desk, vanity, or tabletop into a polished space. Manage your collection with ease! Enhance your office with a structured workspace so you can quickly access writing tools and more to quickly meet that project deadline. In the kitchen, create a well-organized message center for bills, sticky notes, greeting cards, or a grocery list. It looks great on any countertop or vanity without taking up space. In the bathroom, welcome overnight guest with hand towels, mini lotions, and toiletry essentials. The top compartment keeps bottles and containers within in reach while the drawers tuck away a range of bath supplies. The clever design allows you to customize storage to fit your individual needs and space. This stylish organizer is made with environmentally friendly bamboo for a gorgeous natural finish. It includes 1 top shelf, 1 wide drawer, and 2 small drawers (approx. 2 inches deep).No assembly required. Complements most d cor. Contents NOT INCLUDED. Measures approximately 11.87" L X 7.75" W X 8.25" H.
Massca Original Valet Charging Station Multi-Device Office Desk Organizer. Perfect Nightstand Organizer Great for Your Wallet, Keys, Phones and Other Electronic Devices.Perfect Gift Idea. HERE'S HOW YOU CAN DE-CLUTTER YOUR DESK, NIGHTSTAND & COFFEE TABLE with the Massca premium valet charging station, which will allow you to neatly organize all your accessories, valuables and electronic devices like never before. Make sure that your workstation is 100% clutter-free with our multi-device men's desk organizer, which is specifically designed to keep your smartphone, tablet, keys, wallet and other gadgets organized! YOU WILL NEVER HAVE TO WASTE TIME LOOKING FOR YOUR KEYS OR WALLET AGAIN! 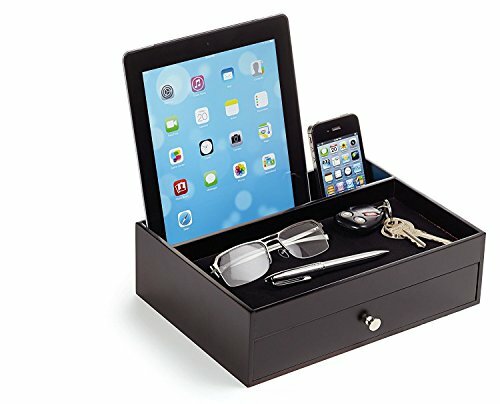 Our stylish night stand organizer for men will enable you to save your precious time and valuable effort - especially when you are in a hurry and need your credit cards, wallet, car keys, house keys or smartphone! All you have to do is use our work desk charging station to organize your accessories and you will always know where to find them! 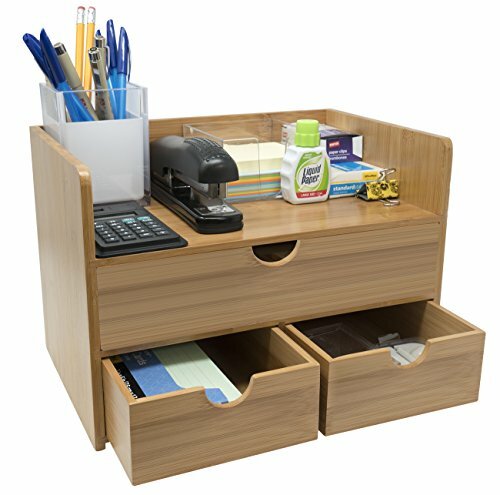 UNLIKE ALL THOSE CHEAPLY-MADE PLASTIC WORK DESK ORGANIZERS, the Massca stunning valet charging station and nightstand organizer is made from high-quality composite wood, which is not only more eco-friendly and durable than plastic, but is also non-conductive and safer for your electronic devices. And the best part? If you are looking for something discreet yet elegant and sophisticated for your desk or coffee table, you should look no further! SURPRISE YOUR LOVED ONES WITH A BEAUTIFUL & PRACTICAL GIFT! Massca ultimate valet charging station for special birthday, anniversary, retirement, graduation, housewarming, Father's Day or Christmas present! Rest assured that your special man will surely appreciate the ergonomic design and unparalleled functionality! These dividers are extremely sturdy yet easily cut to fit. You can use this system in our copier room at work dividing the drawers for office supplies. Pens by color, pencils, glue sticks, rubberbands, etc. 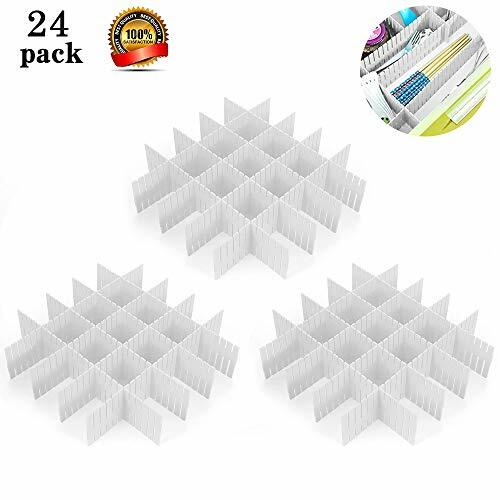 These grid dividers are easy to use and work great for organizing drawers. Fit perfectly into your plastic ornament bin as a replacement for the ruined cardboard dividers. This item help you to organize you little junk drawer in your kitchen so that it is not disorganized with items all over the place. You will love this item!! !